Long before the petrochemical industry began, many straight chemicals and natural materials were used to treat problems with growing plants. By trial and error and probably accidental discovery, some everyday items have been put to beneficial use. Below are details of some of the remedies which have been used as fertilizers and pesticides. Measures are given in metric units, the Conversion Factors section of this site gives US and Imperial equivilants. The leaves of many plants can be used to make a plant food. They are usually soft and lush such as Nettle or Comfrey - fresh young shoots are best. Both of these plants have deep roots so they can bring up nutrients which may not be reached by other plants. These can then be transferred to the rest of the garden by rotting the leaves. The resultant liquor is quite strong and could scorch the roots or top growth so it should be diluted before application. To prepare the concentrate place the fresh shoots and leaves in a container and press down before filling up with enough water to cover them. Leave for a few weeks and decant the liquor, the remaining pulp can be added to the compost heap. It is advisable to wear rubber gloves as due to this anerobic method (no air) the liquid is extremely malodorous and tends to linger! Dilute at a rate of 1 part liquor to 15 parts water to apply as a foliar feed. On well-watered open ground it can be used neat, but for root-feeding potted plants it should be diluted about 1:10. A setup like this made from a piece of drainage pipe can be used to produce a concentrated feed from fresh, green shoots and leaves. 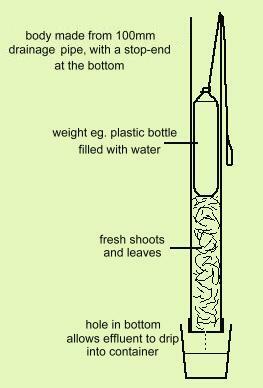 A small hole in the bottom allows the concentrate to collect in a container placed underneath. The pipe can be attached to a wall using the clips which are normally used to secure it. A similar plant food can be prepared using troublesome weeds which cannot be added to the compost heap, eg. Ground Elder or Bindweed rhizomes. There are some elaborate Preparations made from cow manure and silica by those who follow the Biodynamic method of gardening and agriculture. Compost Tea is a name given to a 'brew' of nutrients and micro-organisms which is prepared in an aerated container - an aerobic method. The resultant liquid is watered onto the soil, or diluted as a foliar feed. It is thought that the micro-organisms suppress pathogens in the soil and the plants grow better. There are many recipes for aerobic compost tea, but simply soaking completed garden compost in water for a few days with regular stirring to add air should produce an acceptable product which should not smell. More complex recipes include kelp extract, fish emulsion and molasses with the aeration provided by a fish tank aerator. For acid-loving plants that are showing signs of chlorosis, use a heaped 5ml spoonful (teaspoonful) of Magnesium Sulphate (Epsom Salts) in a 5 litres of water and water around the roots. Yellowing tomato plants can also benefit from this treatment. Many plants produce their own defensive compounds to deter or kill anything which tries to rob them of food or water. These can be extracted and used in the garden to our advantage. There are already commercial products available which are based on plant extracts, eg. Derris from brassicas. Pyrethrin is prepared from the dried flowerheads of Pyrethrum cinerariifolium. The active ingredients are pyrethrins and cinerins which kill on contact by paralysing the nervous system. The insects do not appear to become resistant to Pyrethrin. Over the years gardeners have used a number of concoctions to fight off pests and diseases some of which are included here for interest only as it is illegal in the UK to use anything which is not licensed for specific uses by 'Big Brother' in his ivory tower, or riding on the gravy train, in Brussels. Use liquid soap available from health shops, not detergent as it may damage plants. 30ml liquid soap in 1 litre of water. It disrupts the cells of insects causing dehydration and death. Do not use in bright sunshine to avoid scorching foliage. Boil for 30 minutes, topping up to allow for evaporation. Allow to cool and add a dessertsoppnful of soap flakes as a wetting agent. Strain and use as a spray, undiluted. Boil for 30 minutes, strain and cool. Can be bottled while hot and will keep for 3 months. Use as a drench or spray. Boric Acid (Borax) - a mild acidic powder which is the main ingredient in many proprietary products. Kills crawling insects by attacking their nervous system and causes dehydration - it can be mixed with an equal amount of icing sugar and sprinkled around as an ant bait. Also it can be dissolved in diluted hydrogen peroxide for use as a fungicidal disinfectant for hard surfaces or soil (not on plants). Cinamon powder will deter ants, so if it is sprinkled at the entrance to their nest, they will move away. 1. Non-oily - Chop one or two complete garlic bulbs (heads) and cover with boiling water in a lidded jar. Leave to soak overnight. Strain and add to one litre of Soap Spray. Unused spray will decay but can be frozen to preserve. 2. Oily - 100g chopped garlic soaked for at least 24 hours in 30ml Liquid Paraffin or Baby Oil. Add 500ml water with 5ml liquid soap and stir well to emulsify the oil. This should keep for a few months in a sealed jar. Sprinkle the powder over affected plants or mix with water to make a spray. Do not use metallic containers as they may react with the mixture. Simmer in 4 pints of water for 30 minutes. Strain, leave to cool and add 1 teaspoon of soft soap. Use as a spray for Aphids, Caterpillars, Flea Beetles and Moths. Place dried sprigs of Wormwood in the garden beside carrots and onions to mask their scent, thus distracting insects such as the carrot root fly. Water run-off into the soil from the living plant has a growth inhibiting effect on plants, but this does not occur with the dried herb. Mix chilli powder with bird food. Due to a quirk of nature birds do not suffer from the same painful reaction that mammals do, so are immune to the effect. Mix and dissolve in a cupful (200ml) of water, then make up to a gallon (4.5l) in a watering can to be watered over the foliage every two weeks, starting in early spring and continuing throughout the growing season. The enzymes in a 10 to 30% solution of fresh milk sprayed on plants will attack mildew or it could be a more friendly fungus that grows and out-competes the mildew. A stronger solution will result in a foul smell as the milk goes rancid. for each 28g pour on 1 litre of hot water and allow to stand for 24 hours. Copper Sulphate. Approval for use in gardens in the UK will be withdrawn at the end of 2013 to comply with the implementation of the provisions of Commission Directive 2009/37/EC following the inclusion of copper sulphate in Annex I to Council Directive 91/414/EEC: for blackspot, applied in late January or early February at a rate of 3oz per gallon (85g/4.5 litres), watered over or spray to ensure all surfaces are wetted. This is repeated in March at a rate of 1.5oz per gallon (43g/4.5 litres). Use as a spray wetting all surfaces of leaves and stems. NB. large doses of Copper salts are cytotoxic. You can make plant labels from empty aluminium drink cans. Here is a video clip to demonstrate. There is no commentary, but the technique should be fairly easy to follow. Writing backwards on the printed side while leaning on card leaves a raised impression. You can also use a permanent marker pen. The label can also be used with a tie after making a hole with a puncher. Select young growth from the current year from any species of willow (Salix) with smooth green or yellow bark. Cut into 2.5cm pieces and cover with boiling water just like brewing a tea. Leave overnight and it is ready to use after decanting the liquid. A cold water extraction can be made, but should be left for several days to brew. The Willow water or tea will keep for about two months in the fridge. To use the hormone mixture place in a container and stand the cuttings in it overnight before inserting them in the growing medium. The salacylic acid which is a precursor of Acetylsalacylic acid (Asprin), protects the cuttings from infections, so to help with the rooting process the extract should be used to water the growing medium a couple of times. (may not visible in some browsers).